Ray Bradbury’s internationally acclaimed novel Fahrenheit 451 is a masterwork of twentieth-century literature set in a bleak, dystopian future. Guy Montag is a fireman. In his world, where television rules and literature is on the brink of extinction, firemen start fires rather than put them out. His job is to destroy the most illegal of commodities, the printed book, along with the houses in which they are hidden. Montag never questions the destruction and ruin his actions produce, returning each day to his bland life and wife, Mildred, who spends all day with her television “family.” But then he meets an eccentric young neighbor, Clarisse, who introduces him to a past where people didn’t live in fear and to a present where one sees the world through the ideas in books instead of the mindless chatter of television. When Mildred attempts suicide and Clarisse suddenly disappears, Montag begins to question everything he has ever known. He starts hiding books in his home, and when his pilfering is discovered, the fireman has to run for his life. This is one of the best piece of literature I've read in decade. This is not simply a good book in the Speculative Fiction genre, it's a good book across all genre. It has a fascinating idea, a compelling plot, and a sympathetic cast of characters. The only thing I have issue with is the prose. It get a bit long winded at times, but not so much that detract the overall enjoyment. 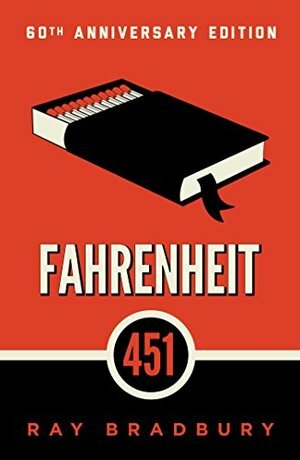 For those who are interested, you can read my full review of Fahrenheit 451 here. I'll admit, I didn't read this book until I was 31. Perhaps, that's why I was able to enjoy it while my 13 year old daughter wasn't. She said it was too metaphorical. I thought the metaphor was beautiful, lyrical, and quite fitting of modern society. This book, along with 1984 and Brave New world were on my "To Read" list since a long time. Finally I read this one. And even though it was short and wasn't as mind blowing as I had expected it to be, it still was much better than most other books I've read so far. For one thing, this is the first book where I have highlighted so many lines and passages. There are some powerful and thought provoking commentary that makes you wonder where are society is going. It was a special pleasure to see things eaten, to see things blackened and changed. With the brass nozzle in his fists, with this great python spitting its venomous kerosene upon the world, the blood pounded in his head, and his hands were the hands of some amazing conductor playing all the symphonies of blazing and burning to bring down the tatters and the charcoal ruins of history. Me: Wow, that is a gutsy beginning, liking the burning. IC: Oooh, I like it! Wait, who is that stupid girl? Why is she talking? She's ruining it! Me: No, now, hold on, I'm only 20 pages in, here. It's got great language. (Remember how much I liked [b:Dandelion Wine|50033|Dandelion Wine (Green Town, #1)|Ray Bradbury|https://d.gr-assets.com/books/1374049845s/50033.jpg|1627774]?) Oh, that is some severe depression, there. IC: That was great. Wait. Is this a book where people who like technology are teh stoopids? Sermon! No want! Me: Just hold on a minute! I don't think that's his point. He's a more complicated author than that. He loved Poe and Melville and Dickinson. Besides, I don't even like TV, and it does have sedative and addictive effects. IC: He also loved Hawthorne. And I do so like TV! CSI! Dr. Who! X-FILES!!! Scully and Mulder are coming back! January 24th! IC: Iphone! Ipod! Kindle! PlayStation! Internet! I LIKE technology. And I like Mildred. She reminds me of people I know. She shouldn't be stupid. She shouldn't be so cardboard. Me: OK, look, just stop. This is a big, important book and almost everyone I know loves it. And I don't think liking Mildred is going to turn out well. Just settle down and read. IC: OMG, there is that stupid girl again. I hate her. And he's special because he looks at the moon and drinks the rain. I HATE BOOKS LIKE THIS! Me: No. Just settle down. Hey, look, a robot dog. Me: Well, that's not going to turn out well. IC: She's back. Make her go away. Me: *Reads some more. * Well, there it is. Happy now? IC: OMG she's still talking! Why?!? Me: OK, Mildred's getting deeper characterization now. That's good, right? Me: Beatty is evil. Do not like Beatty. This is NOT going to end well. IC: Beatty is complicated. Beatty is the best. Me: *sigh* OK, see there, Faber is specifically addressing that TV didn't have to be bad, that it's the content, not the medium. IC: Montag is being a dumbass again. Me: OK, yeah, dumb. Not going to end well. Oop, there you go. Didn't end well. Me: Oooh, chase scene. Really good, right? Me: Don't be difficult. This is getting good. Oh, see there? I like the way this is going. I like Granger. And I like ... Oh, wow. That kind of came out of nowhere. Me: OK, then. Well. Great book. I loved it, right? Me: Really? Because that's another book I'm supposed to like a lot more than I do. Plus this is a theme I really care about. Think about that banned books project and censorship around the world. IC: It still should have been a little better. Me: It was published in 1953. IC: Shakespeare is from the 1600s. Melville was the 1850s. Woolf was the 1920s. He needed to be better. I really did like it, though. Me: OK, fine, but everybody's going to roll their eyes at me for this. IC: I'm on the internet. They can roll their eyes whenever they want and I won't even know. They could be doing it right now. IC: I want to read Dandelion Wine again. Me: And now I have to fit in another reread. 2016 is really not going as planned. IC: That's because your plans are stupid. A masterpiece about a future that already seems too near, Fahrenheit is an unreplaceable example on its genre.